Patrick Chan of Canada performs to "Take Five" at the 2012 Four Continents Figure Skating Championshpis. Reigning World Champion Patrick Chan, 21, took the lead after the short program at the 2012 Four Continents Figure Skating Championships in Colorado Springs, Colo. The Canadian was overshadowed, however, by the performances of the three Japanese competitors who could give him a run for his money in Friday evening’s free skate. Chan opened his Take Five routine with a stumble on a quadruple toe loop attempt, but quickly recovered and took command of the ice for the rest of his program. He scored a new season’s best 87.95 points for his effort. Though Chan is the leader in points, it was Japan’s Takahiko Mura who came away with the most inspired performance of the night. The fifth place finisher at the 2012 Japanese National Championships, Mura was surprised to be included in the elite company of Chan and teammate Daisuke Takahashi, who sits in third place. Mura earned the highest technical scores of the night with his Red Violin program that opened with the only quadruple toe loop-triple toe loop combination of the competition. I was so sad because I couldn’t get into the Grand Prix series. This sadness gave me extra motivation. I understood that if I skate clean like I did today I can get a good score. So this is a very good learning experience for me. The 21-year-old trails Chan by less than five points, earning a new personal best of 83.44 points in the competition thus far. Like Chan, Takahashi fell on his opening quadruple toe loop attempt in his In the Garden of Souls program. The defending champion recovered to nail the rest of the program, and finished with 82.59 points. Another Japanese skater, Tatsuki Machida, 21, had one of the few clean performances of the night and finished in fourth place with 82.37 points—more than 10 points higher than his previous personal best. His Russian folk music program was a crowd favorite. Finishing in fifth place—also with a new personal best, was Kazakhstan’s Denis Ten. The 18-year-old fell on his opening quadruple toe loop, but nailed the rest of his program to earn 77.73 points on the night. 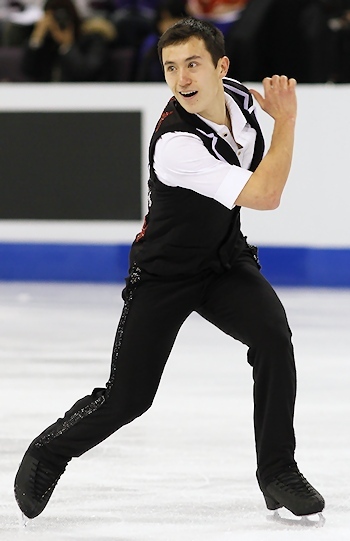 American Ross Miner, 21, finished in 6th place, while teammate Adam Rippon finished in 7th. The two skaters scored 76.89 and 74.92 points respectively—each a new season high score. Miner gave a solid skate that featured a triple Axel, triple Lutz-triple toe, and triple flip. Rippon landed a triple flip-triple toe and a triple Axel, but fell on the triple Lutz. Richard Dornbush, 13th at last month’s U.S. Championships repeated that placement tonight as he continues to struggle to return to his level from last season. He earned 61.34 points with his The Fifth program. Click here for full Figure Skating and Ice Dancing Results (opens in new window). Evgenia Medvedeva of Russia was the first singles lady in figure skating to win a World title at the senior level (2016) after winning a World Junior title the previous year (2015). She is also the first female skater to surpass the 80-point short program mark, the 160-point free skating mark, and the 230-point and 240-point total mark (prior to the introduction of the +5 / -5 GOE). More on Evgenia Medvedeva from Golden Skate.